Recent research has indicated that weekly online quizzes result in high student engagement and positive views regarding the use of online quizzes as well as the student’s preparation for upcoming readings that promotes discussion in the classroom (e.g. Cook & Babon, 2017). Moreover, it has also been determined that when students are engaged with creating and designing tests through which they become familiar with different formats and when these student-created tests are used in the classroom as classroom quizzes, the anxiety students suffer from might reduce as students attain more confidence (Kafrani & Afshari, 2017). Thus, teachers might use students’ questions, as well as their own, for weekly quizzes to promote learning and to encourage student participation. 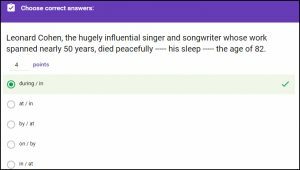 In previous issues of the AATSEEL Newsletter (Kılıçkaya, 2010; Kılıçkaya, 2015), I tried to introduce several websites that can be used to create online quizzes such as QuizStar. 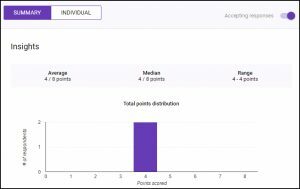 In the current column, I have decided to show how to create an online quiz, a much-awaited feature that has been included in Google Forms. 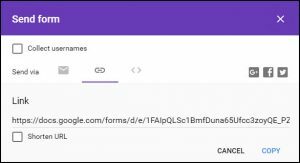 Google Forms, available at https://forms.google.com, can create various online forms, from personal contact forms to collect responses and suggestions to education forms such as course evaluations and quizzes. The main advantage of using Google Forms is that it provides a variety of tools to create online forms, as well as the materials needed to create them, without the need to deal with programming codes or paying for hosting. 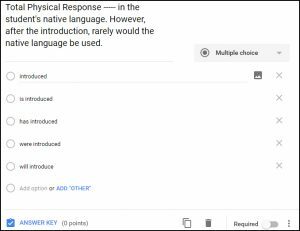 An account is needed to use Google Forms, which I believe many readers already have, since Google has been popular with many teachers and users. After the login, find the Education category in the Template gallery. 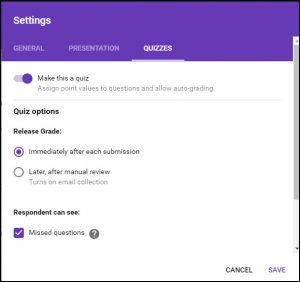 Click on the ‘Blank Quiz’ template, and Google Forms will open a new page where you will create your online quiz, including your questions. Before writing the questions and the options, we will need to provide a title and a description for our quiz. As an example, I have written ‘Advanced English Grammar I’ and a brief description of the quiz. Then, I have provided five options for my first question. On this template, Google Forms automatically selects Multiple Choice as the default type of question. However, there are some other options such as Checkboxes and Short answer. 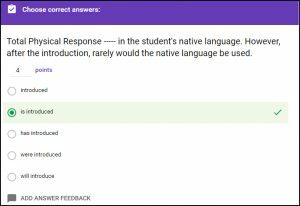 You can select appropriate question types based on your needs; however, it is important to keep in mind that some question types do not allow for automatic grading. When we are finished with writing the question and setting the options, we will determine the correct answer and provide appropriate feedback to our students based on the answers. Click on the link ‘ANSWER KEY’ and select the correct answer. After selecting the correct answer, we will click on ‘ADD ANSWER FEEDBACK’ based on the correct and incorrect answers, which is a very nice feature since it allows entering different feedback for each correct and incorrect answer provided to each question. In order to add new questions, just click on the ‘PLUS’ icon on the right side of the questions and follow the procedure above. 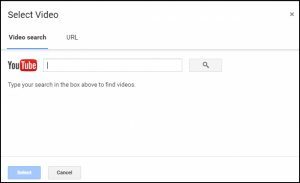 If needed, we can also add our own images (or Google images) using the ‘IMAGE’ icon and/or videos from YouTube using the ‘PLAY’ icon, which can be used to test listening comprehension. When we are finished writing all the questions, we can preview it to check how our quiz will look like using the ‘EYE’ icon on the right top side of the page. If the quiz looks fine, we can then change the settings using the ‘GEAR’ icon. In the General Tab, we can adjust several settings: ‘Collecting email addresses of the quiz takers’, ‘Sending Response receipts’, and ‘Requiring sign in’, ‘See summary charts and text responses’. By selecting the options based on our needs, we can get students’ email addresses, in order to monitor each student’s progress and encourage them to check their performance. Moreover, we can also select useful options using the Quizzes Tab. The last step will be to share our online quiz with our students. This can be done through the link ‘SEND’ on the top of the page. Sharing the quiz can be done in three different ways: sending e-mails to our students, sharing the link with them through emails and/or some social networking sites such as Facebook, and embed the code provided into our personal or school webpage. Of these options, I suggest sharing the link, which is automatically created by Google. On this page, we can also ‘collect user names’. When our students respond to the questions, we can check their performances on the quiz by clicking on ‘RESPONSES’ on the page of the quiz. 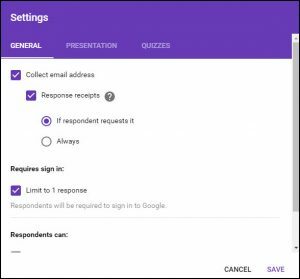 Although I introduced several tools that can be used to create online quizzes, the use of Google Forms in creating online quizzes will make many teachers happy since Google provides a variety of services including Gmail and Forms and much more in one place. 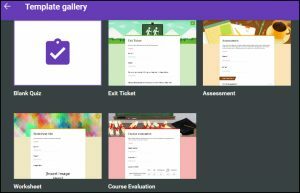 The main advantage of using Google Forms lies in its easy menu style and editing options. Moreover, as it is widely known that websites frequently come and go and some websites offering free services can make them paid in the future, Google Forms appears to be a reliable tool that teachers can rely on in their efforts to make language learning efficient and fun. Kafrani, J. D., & Afshari, M. R. (2017). Alternative assessment: Student designed test evidence in an Iranian EFL context. In R. Al-Mahrooqi, C. Coombe, F. Al-Maamari, & V. Thakur (Eds. ), Revisiting EFL assessment: Critical perspectives (209–219). Cham, Switzerland: Springer. Kılıçkaya, F. (2015, February). Socrative: Student response system for language teachers. The AATSEEL Newsletter, 58(1), 11–12. Kılıçkaya, F. (2010, December). 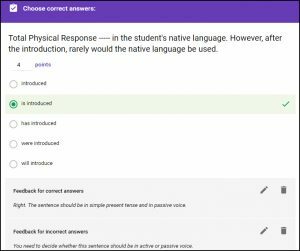 Creating language quizzes: QuizStar. TheAATSEEL Newsletter, 53(4), 5–6.